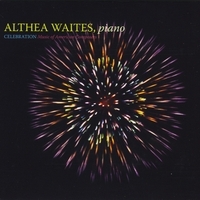 To read more about Waites and her collaborations with Cacioppo and other composers, visit http://africlassical.blogspot.com/2012/08/john-malveaux-professor-waites-is.html. 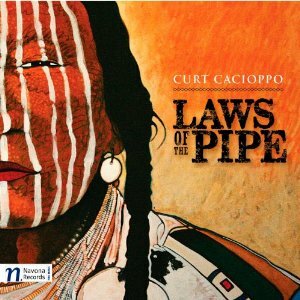 This collection of musical elegies and celebrations by Curt Cacioppo skillfully evokes a Native American time, a space and a people. The history and the literature these meditations trace are often tragic—intensely dramatic. Tone poems infused with vibrancy, they elevate. Listen to the “Invocation” trilogy—the work summons images of Native American lifeways paradoxically familiar and strange. It calls the listener to muse on the deeper meaning of past narratives, while “Kinaaldá” joins in the ancient, enduring Dance of Life. Direct, moving, and inspiring, Cacioppo’s tribute avoids the obvious, eschews triviality, and does not pale. His offering to first peoples invites repeated listening, an erstwhile ritual. In the case of “Wolf,” based on the poem by Peter Blue Cloud, emotion overcomes us. The Sonata No. 2 for unaccompanied cello (2000-1), The Vanishing Pavilions for piano (2005), Caelum Dedecoratum for unaccompanied contrabass (2006), and the Fourteen Pieces for unaccompanied violin (2007) link together in an unbroken (and perhaps still unfolding) succession of works for solo instruments that constitutes a substantial measure of Michael Hersch’s creative output. Does the romantic condition pertain: the soloist as virtuoso, the artist as a lonely figure da solo in society, the sensitive individual with no kindred soul to accompany him? As pianist and exponent of his own music, Michael attains an unmatchable degree of virtuosity. In this respect he fits the composer-pianist mold of Liszt, a distinction all the more appreciable in the post-MIDI age when fewer and fewer acquire the skills necessary to realize their music in live performance. Our friend and mentor George Rochberg could be heard frequently quoting Saul Bellow, saying that “it is sheer madness to want to make art in America.” Few who embark on a life of writing serious music can escape this, and Michael undoubtedly has felt the role of the wanderer searching for that solace, that place, that “geliebtes Land, gesucht, geahnt, und nie gekannt.” That even Schubert was seeking this too, while living in the cultural nexus of early 19th century Vienna, poses no irony, but rather demonstrates that the beloved land, sought, yearned for, and never known is as much a spiritual as physical region whose pursuit is somehow central to the creative personality. Equally hard to find are peers, comrades who will walk with you, commiserate with you, interact on levels deeper than decorum of collegial politeness. Michael is no stranger to exercising self-reliance. His music will not greet you like Morgenstimmung of Grieg, but Michael nonetheless exhibits the Romantic disposition all the same, tracing back to the very epiphany that caused his musical awakening: the transformative, life changing experience of watching Solti conduct the Beethoven Fifth Symphony (the scene could have been scripted by Rolland!). His solo works bring this nature into distinct focus. Nostalgia is one facet of Romanticism, a fascination with the past, a curiosity about what came before. While Michael is fully conversant with trends of modern and contemporary intellectualism (Milosz, Middleton) and the musical avant garde (Rihm, Feldman), his interests look back from Hölderlin (born the same year as Beethoven) on the literary side to Josquin des Prez, on the musical axis, and Josquin’s elder and possible teacher Ockeghem (born some 30 years before the invention of the printing press). A framed print of the 500-year-old Laurana/Piero della Francesca “View of the Ideal City” adorns his living room wall. One hears that he has absorbed motifs even more archaic, and can clearly recognize early trecento resonances and fragments of Gregorian chant. Exactly what elements from which sources are to be discerned, and how they are integrated I will discuss in a moment. First, it seems significant to mention influences that one might expect to find in the music of an emerging composer in the U.S., but which appear deliberately to be excluded from Michael’s. Among these would be some distinctly “American” feature, for instance, a reference to a composer predecessor like Copland or Ives — but with the exception of what is likely an entirely incidental similarity to Carl Ruggles, I can identify none. A nod to jazz, or an acknowledgement of one or another vernacular or ethnic idiom – don’t see that either. No populist inclinations evident whatsoever in musical content, textual associations or titles (here he will sooner use French or Latin). He seems to eschew Americana of any kind. The only case that might be made is possibly in relation to George Rochberg — certainly one of the deans of American composition — if you admit to a fundamental compatibility between Michael’s procedures and Rochberg’s aesthetic of liberally siphoning from the past. Even that is a stretch. George was not exactly a flag waver, and in any case, the manners of execution of these two, even if rooted in the same premise, are quite different. George’s method so often involves quotation and juxtaposition, Michael’s is intuitively based on filtering and synthesis. The outward result is that George’s music sounds more eclectic, Michael’s more homogenous. Let me get into a bit of detail to explain what I mean about the works on the program tonight, with reference also to Pavilions. Somehow the listening experience recalls aspects of Die Winterreise, Das Lied von der Erde, bravura passages in Debussy and Messiaen. The way dismembered vestiges of phrases once lived, echoes of nursery rhymes, the sound of a kid practicing his Bach invention, bob up and down in the unrelenting funereal procession of tolling is almost graphic. The canon is grim, the species exercise afflicted. No. 2 and its relatives are brilliant. One could hardly imagine a better ending…the inevitable ascent into the upper register. In its place among other extended sets for solo piano, various things come to mind — the Opus Clavicembalisticum of Sorabji, Vingt Regards, the Etudes of Ligeti, and so on. How does Pavilions distinguish itself among them? Sorabji is the culmination of the composer’s singular approach to improvisation — one of your men at Peabody is an expert on this. The Messaien derives from his Catholic mysticism, ornithology and his peculiar synaesthesic harmonic system, not to mention all the rhythmic modes, etc. Ligeti’s work is genre defined — these are studies in one way or another, ricercari. Larry Read wrote an extended work which I think was nominated for a Pulitzer last year, but it is in my opinion a throw-back to Busoni. Baratello’s Malebolge which I’m scheduled to premiere is a dramaturgical, wry and very descriptive interpretation of a segment of the Inferno (strangely Mozartean it its way). My own Ciclo metamorfico is full of nostalgia and place, sometimes savage and sometimes humorous. What to me differentiates Pavilions from all of these is that it comes across almost as a photo-journalistic display. There is innocence and pathos, mercury and stasis in the narrative, yet in an ancient classical way, no tinge of sentiment from the omniscient. The work does not serve as a vehicle for the narrator’s feelings, nor does it function to advertise virtuosity or demonstrate style. The recurrences almost remind me of those formulas in Homer — “the goddess grey eyed Athena,” etc. For me this seems its most unique quality. In form I still regard the Pavilions as a series of frame stories, like those of Wolfram or Chaucer or Boccaccio. Or perhaps it could be compared to a tapestry, like the ancient one in Bayeux, a pre-photographic visual documentary of the exploits of William the Conqueror, 230 feet in length and a foot and a half high. Lateral exposition is a principle that the pieces on the program tonight all share. But of what are these forms made? When I first heard Pavilions, a surprising economy of basic musical ingredients could be distinguished, all of which are common to the string pieces. In the area of pitch, three principal harmonic preferences can be cited. The composer finds life in semi-tone groupings – Andrew Druckenbrod has already drawn attention to the C-sharp-D-E-flat cluster that begins movement V of the cello Sonata. We see this grouping within the first 8 bars of the bass piece, and on the first page of the Fourteen Pieces for violin, at various transposition levels, and recurring conspicuously. This type of chromatic sonority derives from the more contemporary vocabulary. However, it can be elaborated non-percussively in ways that recall 4th species countrapuntal practice or primitive organal style. Another building block is the combination of the perfect fifth with an acciaccatura tone a half step above the bottom note – for instance, E-F-B. The components – the perfect fifth, and the half-step or minor 9th – may also be separated. Of course within this grouping is contained the tritone, which occasionally comes to the fore, as in movement III of the cello Sonata. My initial reference point for this tri-chord, which is the union of a perfect consonance with maximal dissonance, was the left-hand figure of Der Leiermann, the final song of Schubert’s Die Winterreise. I still feel there is a connection, and not just for harmonic reasons. However, there are antique examples yet closer to this configuration, such as can be heard in the “et tibi reddetur” of the Ockeghem Missa pro defunctis, or the older pseudo-Neidhart chanson Winter dîner künfte. The mixture of these and other elements is facilitated because of the way they have been pruned of their respective contexts. In addition to these chord types, we can witness generous employment of plagal cadence patterns and half cadences, outlined in skeletal two-part texturing. It is in these moments primarily that the sounds of the imperfect consonances occur. A strong case can be made for the full tonal cadence in the final 16 or so measures movement V of the Sonata (although the very last bar would be subdominant chord – an aborted plagal resolution?). Triadic sounds appear infrequently, although when they do, it is sometimes with heroic struggle, major and minor often battling it out. Resources for melodic construction other than the harmonic units described suggest a more modal origin than anything else. Often the archaic modes are evoked (the chant Kyrie Orbis Factor suggests itself in the cello piece), along with scalar passages whose pitch content seems to have been freely fashioned. A prevalent technique for two-voice phrase construction is Stimmtausch, or voice exchange, one of the most ancient contrapuntal devices. When applied to intervals like the minor 9th, it produces successions in which a dyad with A-flat on top and G on the bottom moves to one with G on top and A-flat on the bottom, thus extending and developing the dissonance. The tempo and rate of unfoldment of many sections is elongated – here one thinks perhaps of Pärt, or the “dynamic stasis” of Giya Kancheli, as well as the abundant antecedent examples in Wagner, Schubert and Beethoven. Somehow Der Abschied comes to mind, with its redundant trill figure over the low C drone. Much of Michael’s writing in the pieces we are hearing tonight is tethered to the open strings, and in fact even in passages that don’t sit upon a sustained tone he will make the indication “droning” or “drone like.” The use of silence is prominent, of withholding the next sound. On the other hand, the music can reinvigorate itself at any time with a dynamic or articulative catalyst, press forward in crescendo and accelerando, and cover a wide range within a matter of a few measures or beats. The timing of the static versus the disruptive/animated is critical to keeping the attention and creating drama. A judicious use of redundancy, repetition and recurrence demarcates structure and guides the listening experience. I have touched upon the question of form, but not sufficiently to address the obvious fact that these are all very extended works, Pavilions by itself taking more than 142 minutes, exceeding Winterreise by half an hour. While such divina lunghezza can be attributed to the slow pace of some of the music, or likened to medieval frame stories by way of explanation, it might be useful to view the works within the continuum of Romanticism, which is where we began. Sonata No. 2 for cello has no extra-musical inspiration behind it, however, as a sonata, is more of a suite in the baroque sense, and thus a collection of short pieces. The idea of an extended structure being the sum of an agglomeration of smaller units becomes a modus operandi in the Romantic period, bolstered especially when the individual components are bound together by segue, cyclic musical elements, by a common extra-musical theme, or by two or more of the above. In the case of the Sonata, cyclical development most definitely takes place from movement to movement, inviting the work into the Romantic world. The score of Caelum Dedecoratum is prefaced with passages from Christopher Middleton (who inspired The Vanishing Pavilions). They cast an indelible aura over the work, and though it is not divided into smaller movements, the literary imagery brings it into the Romantic realm of program music. Eight of the Fourteen Pieces take texts of Primo Levi as their point of departure. These are interspersed with pieces designated by genre indication (intermezzo or nocturne) rather than literary reference, although the intention certainly is that the literary imagery resonate and carry over into the non-text movements. What we have then in each case is a newly imagined application of the Romantic concept that an assemblage of shorter musical segments leaning together can yield a unified discourse of macro proportion. Patrick Soluri’s The Inferno of Dante: Canto V (2002), Louis Andreissen’s Racconto dall’inferno (2004), and Vladimir Martynov’s Vita Nuova (2009), to name a few — Dantists and concert pianists alike should take special notice of the formidable 9 part cycle completed in 2007 by Venetian composer Marino Baratello. Born in 1951, Baratello calls his work Divina Commedia: Cerchio VIII – MALEBOLGE. As the first pianist to learn the cycle in its entirety, and having taught it to my students, it is with seasoned enthusiasm that I share what I hope will be some useful thoughts, insights, experiences and strategies for understanding, and entice the reader to seek out this important contribution to piano literature. I became acquainted with Marino Baratello ten years ago after attending a concert that he conducted of his own music at the Chiesa della Pietà in Venice. (On that program, in fact, was his piece for flute and soprano entitled Da una Lectura Dantis.). Not long after our first meeting I learned that he was embarking on a series of piano compositions – nine in all it was to be – based on Dante’s Malebolge, the idea having been suggested to him, if I remember correctly from conversation, by the artistic director of the Teatro Lirico in Rovigo, Massimo Contiero. The pieces were not exactly written in sequential order. Already familiar with Baratello’s Klavierstück, I had arranged for its performance and recording by the American pianist Lisa Weiss, and it was subsequent to this that Baratello composed one of his first Bolge, number VI, which he dedicated to her, and which she premiered in Venice in October of 2004. In fact Bolgia V was the very first of these pieces to come forth, written for and dedicated to Giovanni Mancuso who premiered it also in Venice the preceding year earlier. Bolgia VII, dedicated to me, arrived in my mailbox in the spring of 2005 and was premiered in the US in September of 2006. Eight of the pieces are dedicated to pianists – those named, plus Daniel Luzko (III), Jens Barnieck (IV), Brian Ganz (VIII), and Aldo Orvieto (IX). The first piece, which comprises Bolgia I and Bolgia II together, following the structure of the Canto, is doubly dedicated to Ronald and Gordon Knox, Italian-American friends and supporters of the composer. This piece was among several that Baratello composed at Villa Montalvo in California during the fall of 2006. Bolgia X, completed in Venice in April of 2007, was assigned its dedication to Brigitte Poulin prior to the Canadian pianist’s performance of a substantial portion of the cycle on a concert of the Venice Biennale September 29, 2009, in the Arsenale’s Teatro Piccolo. I performed numbers I & II, III, IV, VI and VII in a variety of contexts, and prepared the entire cycle for premiere in Tokyo. Unfortunately, due to persistent scheduling difficulties there, the premiere date was never fixed. An alternative opportunity to offer the world premiere of the complete work in a U.S. venue in a coming season, perhaps in Philadelphia, is being pursued. Baratello’s Malebolge is available from Edizioni Musicali Rai Trade, Roma-Milano. Baratello spoke to me of his dissatisfaction with much of the recent piano music he had been hearing back in 2002, the principal flaw seeming to be its reliance upon pedal saturation and 19th century clichés. He was listening avidly to Mozart sonatas throughout this period, complementing his general inclination toward the music of Miles Davis and Jimi Hendrix. He remarked that Butch Morris had piqued his interest. (Despite his pedigree as a student of Sinopoli and Ernesto Rubin de Cervin, his virtuosity as a practitioner of traditional solfege, and his long career teaching it in the Italian conservatory system, Baratello’s roots go back to the guitar and vernacular genres.) These indicators intrigued me with respect to the manner in which he would translate such attitudes to the instrument. What ultimately obtains in the Malebolge cycle is a range of pianistic approaches that reach from the extended techniques of the ’60’s avantgarde all the way back to 13th century portative organ traceries of Francesco Landini, and beyond the keyboard by asking the pianist to become narrator, singer and actor as well. “Polistilistico” and “drammaturgico” are the composer’s words for it, and though it may sound aleatoric or improvised in spots, it is entirely deterministic and precisely notated, the composer fully aware of deviations in performance from what he has prescribed. The cycle in its entirety takes approximately 45 minutes to play, comparable in length to the Hammerklavier Sonata, and would constitute a solid half of a recital program. In the first piece, which couples Bolgia I with II, we see a heightened degree of attention given to the distinction between passages to be pedaled and those marked “via il pedale!” The extremely challenging “adulatorio” section spans two pages and is notated on 3 staves. No matter whether the composer’s part distribution is followed or one reassigns the middle staff material, one hand or the other has the responsibility for two completely contrasting musical strata, one legato in wide leaps, the other, in a narrower range, staccato or two-note slurred that not infrequently crosses with the other parts or produces the vexed unison in which the restriking of a sustained tone is forced. It is like a hyper-Dohnanyi finger independence drill, the sum total of which is yet to sound like honky tonk or perhaps mechanical piano. Redundant utterances here represent to me the repetitive praise of panderers and flatterers, heads nodding in feckless sycophancy. Half-step clusters, polymodal grace note runs, melodic doubling at the minor ninth, and extreme registrations alternate with moments of medieval organum, florid sus-4 figuration that wafts in and out, and quipping phrases in skeletal two-part counterpoint. Here a baroque mordent or a random 6/4 chord, there a flurry of repeated notes reminding one of liturgical incantation and by the same token Jerry Lee Lewis. The second segment of the piece is written without bar lines, although meter signatures appear above each system (1/8 is the smallest measure unit). Within a single line of music 11 dynamic levels may be called for, not including accents. Bolgia III begins with a page-long “tormentatissimo” toccata passage, a sort of study in major thirds with added semi-tones that descend chromatically against a central G pedal point. The catalyst is a four note chord marked fff, densely compressed within the slim space of a major ninth, and constructed rather than of chromatic dissonances, it is built out of notes of the pentatonic scale, arranged in 4ths superimposed). With this opening slap comes an ironic grimace of someone mocking the damned who are suffering burning coals under their feet and trying to dance away their agony. I wonder too if the composer means to rope the pianist into kindred distress by notating pitches for the right hand on the bottom staff, and vice versa, creating a sense of visual and choreographic torment at least upon the first few readings. Related to this is the practice of asking for cross hands execution of notes in extreme registers, which we get a taste of even in the first piece, and find replete in later ones. After the toccata, we have a sudden shift to a three-part texture that reads like a figured bass accompaniment to an art song by Alessandro Scarlatti. (At the composer’s command, one must resist the temptation to bring sentiment – “O cessate di piagarmi” for example — to any such passage! There is no breathing space for emotion as we are hurriedly whipped and prodded along in our infernal toil. “Don’t play it like Schubert!” he chides, even though a beguiling plagal cadence entreats. “It is anti-romantico!”) The “requisitorio” section toys with the Lydian scale, the rhythm planed out into continuous eighth notes, and the tessitura confined between E and B above middle C – again, a passage requiring no wider a keyboard gamut than that of Landini’s portative organ. The shared stemming between the staves takes on a graphic aspect, almost of caricature, in the second half of the middle system on the last page. The low D’s, four ledger lines below the left hand staff, look like feet with long legs attached, and the spaces between the repetitions makes it seem like the feet are attempting to hop off of hot coals. I taught a few of the Bolge to my students, and with this one in particular, a clear allusion to Stravinsky evidenced in the theme at the poco più veloce on page 2. More diabolical, of course, but it compares so neatly to the famous Dance of the Ballerina solo trumpet excerpt from Petrouchka. Interestingly, when I coached this piece with Baratello, he invoked Stravinsky (the only other composer he ever mentioned in relation to his work was John Cage), not in connection with this passage per se, but in the general sense of approaching the music robotically, incisively. By contrast, at the very end of that section, in the 3/8 of the last system, he confided that this conspicuous articulation was a deliberate blues inflection applied to the phrase ending. In Bolgia IV we have our first taste of unconventional or extended techniques. Page one consists exclusively of sounds made by stopping the strings with the left hand and striking the corresponding notes on the keyboard with the right, all with the sustaining pedal down. Cavernous echoes result. As always with inside the piano writing, the player has to be ready to adapt when confronted with an instrument whose construction differs from the one that the composer worked his solutions out on. Particularly with a rapid leap as in the eighth 2/4 bar, or with certain internal glissandi, it may be impossible to negotiate the stopped notes or finish a scale because an iron plate strut obstructs one’s positioning or motion. (For this reason, the composer has provided separate ossia versions of those pieces involving such techniques suited entirely to the keyboard.) The remainder of Bolgia IV uses only “suoni normali.” Here too we find the bony two-part writing, now with eerie soprano ostinato effects tinkling above. A beautiful development of a minor third occurs in the bass staff over the course of 11 bars – the variegation in ties and note reiterations elegantly interacts with the intervals and syncopations of the treble. The pppp marking on the last page keeps the “misterioso” going to the very end. Extended techniques are called for also in Bolgia VI. Two devices new to those already encountered in the cycle are employed here. The composer asks that a bracelet be draped over the bass strings so that a sizzling sound will be emitted when they are set in vibration, and to amplify this, the pianist is to mouth a hissing sound to convey further the image of something frying. From the logistical point of view, the performer must be very nimble in making transitions to and from the extended techniques passages so as not to break the dramatic flow. I relish the contradiction between the first two pages of this piece, the oblivious leggero answered by the rapid-fire right hand sixteenth notes and vehement McCoy Tyner left hand pesante in bars 27 – 31. I also found an opportunity to put my old Italian lire coins back into circulation, using them in ways to realize some of the non-keyboard passages. Both this and the previous piece are closely related to Bolgia II, and the recurrent materials in their recognizability both help to facilitate the pianist’s learning and promote comprehensibility of form for the listener. Bolgia VII was my point of entry to the cycle. It was the first of the pieces I had a score of, receiving it as an individual concert piece. I was initially learning it from manuscript, too, which added considerably to the adventure. From the start, the wicked and wry transparency and prickly sparseness of texture, the proliferation of ornamental figures, the kaleidoscopic jazz and show music fragments and incessant contrast all challenged my ability to synthesize the content into a fluid discourse. Application of the sostenuto pedal is subtle here, as later on (and earlier in Bolgia V), but there are no extended techniques. However, one must recite on two occasions while playing. The first quote is line 127 of Canto XXIV – harmless enough. The second, though, I caution the performer about. In the midst of a fierce cadenza, the pianist is directed to shout the infamous curse of Vanni Fucci from the first terzett of Canto XXV. Not only this, but the expletive gesture of the figs (comparable to holding up the middle finger) is to be thrown at God after striking the chord on beat three of measure 73. Do not assume that God acknowledges the quotation marks either in what you say or what you enact, and be prepared to suffer possible consequences. (Just as I was about to begin touring with this piece, I was diagnosed with cartilage degeneration in the third finger DIP joint of my left hand!) Meanwhile, all of the two-part “invention” counterpoint has a jazzy feel to it, sometimes more bee bop, sometimes more elastic. The F∆7 chord that frequently occurs is among several such jazz sonorities. This piece shares material with Bolgia IV, Bolgia V and Bolgia VIII. 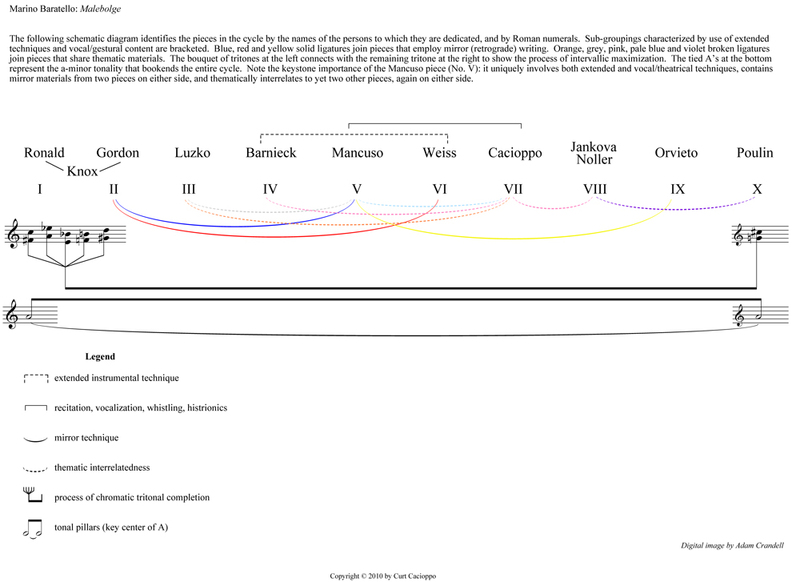 Bolgia VIII with its opening 8 against 5 groupings begins with a flourish. Much of what follows is in a toccata style, in which the registral and dynamic shifts, along with the contrasting subdivisions, offer the main challenge. From the “vorticoso” section, the low register of the instrument is explored, again with polymodal scale groupings. The rapidly shifting dynamics are of utmost importance to the composer, as is an aversion to using the sustaining pedal. (This is not to resemble the blurred bass roarings that go on in pieces by an Alvin Curran.) Rather than single notes in rapid repetition, repeated chords often in both hands convey the declamatory and maledictory message. The ending is turbulent and abrupt. What is unresolved in the piece is taken up in Bolgia X. The ninth Bolgia, though demanding no extended techniques, is in many respects a mirror of Bolgia V. The ripping angularity of the first page is answered by a melody of meandering legato eighth notes on the next, accompanied by thickly daubed thirds in the bottom of the bass staff. The writing reminds me of the fifth piece in Schonberg’s Op. 23, the waltz, though leaner and meaner, elbowing about with intentional awkwardness (the victim has after all been decapitated, and is carrying his head out in front of him like a lantern). Both the 2/4 passage on page 1 and that at the bottom of page 3 can give an impression of Middle Eastern melos, and to be sure, this is the Bolgia in which Mohammed resides. Massive retrograde restatements of segments from previous Bolge are presaged by an internal retrograde statement in diminution of the legato eighth note passage at the top of page 2. Conventional techniques apply throughout Bolgia X. This last piece commences as a kind of upside down Mephisto Waltz. Resuming the extreme cross hands material from Bolgia VIII, the pianist’s body must twist in order for the left hand to reach double notes well beyond an octave above the top of the treble staff. And one is asked to make an enormous leap from the upper to the lower register a lateral distance of almost one yard (greater when you add in the extra length of the arc that must be drawn) in the space a sixteenth note at a tempo of quarter = 108, expected to hit the target note with precision! This is at least three times more dangerous than any of the treacherous leaps in Beethoven’s Op. 106 first movement. The contortion mimics the struggling of someone to free himself from a trap. Vigorous repeated acciaccature in the high register gradually work their way, toccata style, down to a pianissimo theme strangely reminiscent of Beethoven’s Turkish March. The treble quivers with repeated notes (or is this a frenetic tapping to be rescued? or maybe a reflex tremor to discharge pain? or perhaps a cackling sort of laughter, crazed or sardonic? ), a tolling rhythm leads to what could be a vestige of a Viennese waltz, and a menacing trumpet call motif presses to a critical fermata where the composer instructs the pianist to stomp on the sustaining pedal sffff “with violence.” What comprises the last ten measures of the piece, and of the cycle as a whole, is a treble study in perpetual motion with rude and random sforzandi. The expression marking “compiaciuto” seems contradictory until one refers back to the Canto and considers whose gratification or pleasure it might reflect. Is it the fleeting contentment of Gianni Schicchi who, in his rabid running, stops to mangle his fellow dead? As always, if the interpreter is perplexed at any point by the score, he has only to go back and consult the cantos themselves and let Dante and Virgil be his guide. Exploring the literary parallels between the poem and the music offers ample rewards. In fact, one of the triumphs of the composer is that his music invites the interpreter to exercise his own imagination in relating what is in the text to what is on the staff. Quite specific correspondences can be found between the musical content and the characters and actions narrated by the author, as just demonstrated. Additional examples readily come to mind. The rapid pianissimo scale at the beginning of Bolgia VII, which starts on the highest E of the piano and descends to G below the bass staff, requires the suppleness of a virtuoso technique, but is not for bravura display. Rather, it represents the chill, the shiver that Dante feels upon witnessing the cold facial expression of his mentor, which he likens to a hoar frost, as they enter this ditch of Hell. The elusive continuity of Bolgia VII owes to a consistent pattern of phrase dissolution, a device reflective of the punishment the sinners (thieves) must endure: they are penetrated by serpents, then disintegrate by flame into ash, only to relive the process ad infinitum. Musically this yields a sequence of pointed attacks extinguishing into ornaments of various lengths and contours. Over the flourish in measure 1 of Bolgia VIII I have inscribed, “Godi, Fiorenza!” the exhortation that opens the Canto. Above measure 120 I have inscribed “air of Gaeta,” at 165 “horses,” and at 195 “squall,” in direct reference to respective text lines 92, 36 & 58, and 147. On the title page of each Bolgia I have noted which sin and punishment categories the piece will deal with — “Simoniacs, inverted baptism, feet ablaze,” or “boiling pitch, clawing demons, grafters” — just to click into the right frame of mind before playing. On a level beyond text painting, elements of the author’s disposition and tone, metaphorical concepts, even his technical devices are appropriated, transformed and applied by the composer. Dante writes in the vulgate, and Baratello embraces numerous vernacular idioms in his music, as already intimated. In the Inferno Dante cultivates the grotesque and delves into the disgusting – the obscenity can be dramatic – all of which Baratello translates both in musical and histrionic gesture. Among the allegorical images in Dante, that of the mirror is frequently discussed: the eyes of Beatrice are mirrors, earth is a reflection of heaven, man a reflection of God, the inferno the reverse image of paradise, the dark wood is the opposite reflection of the Triune Circles of pure light. The contrapasso itself reverses the sinner’s crime into his punishment, the fortune-tellers walk with their heads on backwards, and so forth. Baratello seizes upon this concept and employs it as an organizing principle, recapitulating large tracts of his musical text in retrograde order linking disparate pieces together. Likewise he will parse out materials from an earlier piece two pieces later (this happens 3 times in the cycle with notable periodicity), in a manner analogous to poetic rhyme, and bordering even more closely on Dante’s terza rima itself. The long and perpetual tradition of Dante influenced cultural products very well dates back to the poet’s own time. (If Mimi Stillman surmises correctly, Dante’s friend Casella set to music Amor che ne la mente mi ragiona, the second canzone from Convivio, the song Dante describes hearing him sing in the Purgatorio.) The durability of his work and its never waning relevance over 700 years is an absolute marvel in the history of Western art. 1989 brought us Peter Greenaway’s mini-series “A TV Dante,” which realized cantos I – VIII, and won a Prix Italia. I recall 3 years ago watching Roberto Begnini’s TV comedy spoof on the Inferno broadcast over the RAI. Even in the popular realm the poet’s trilogy is so well known and so deeply ingrained that modern day humor can spring from it. The pianist Ben Pasternack of Peabody Conservatory called my attention to a death metal song “Dante’s Wild Inferno” by the Swedish band “Meshuggah,” and they are not the only such group to wear the mantel. On the serious side, Barone Albrizzi told of an actor’s formal reading of the Commedia in Florence not long ago for a public that filled a soccer stadium. But it is in the repository of art music that the richest response to Dante’s poem can be found. Maria Ann Roglieri in her Dante and Music (2001) has compiled an exhaustive index and cross reference of musical treatments of the bard’s writings spanning many centuries of compositional activity worldwide. No surprise that Liszt remains the most prominent Dantean composer, with Tchaikovsky carrying significant weight, in terms of audience exposure and expectation over many generations. And it is precisely the ubiquitous Romanticization of the theme by these 19th century icons that Baratello wishes to overturn. Roglieri’s roster takes us to examples of solo piano music which, when compared with Baratello’s effort, reveal its unique quality and achievement. The Trois Nocturnes Dantesques of Georges Migot (1935) are fine works, at times mysterious, at times passionate, even rude, always idiomatic with frequent passages in double thirds, sumptuously textured, full of rubato, ultimately in a style between Fauré and Debussy. No specific literary citations are present. The Dante Sonata by Poul Ruders (1970), a 25 minute piece inspired by two lines from Canto VII of the Inferno, is at once more modern and elementary in its chordal vocabulary than Migot. Its repetitiveness is offset by the use of cluster harmonics and, in the second segment, evocations of Gregorian chant. Roglieri notes generously the much more current music of the Italian-Canadian composer and Dante devotee Ennio Paola. The work recommends itself to some as “tuneful, accessible and well-written,” though the pieces in Lux in Tenebris seem more in the nature of vignettes or sketches (ala MacDowell, perhaps) welcoming the accompaniment of other media, and offer only modest pianistic challenge. Still focusing our lens on solo piano music, it is difficult to discern any direct line of descent from Liszt to Baratello. Aside works of interim composers, Baratello’s stands unprecedented on the basis of three criteria: scope, fidelity to text, and repudiation of Romanticism. We are hard pressed to find an integrated cycle of nine pieces aimed at such a specific text unit within Dante. The content of that text unit is at the forefront of the composer’s mind, and closely determines the musical substance on a variety of levels. The banishment of Romantic convention is apparent from every angle – hardly a single identifiable overlay of melody plus accompaniment can be exposed, nor the sprawling arpeggios, spongy chords and gushes of pedal of the Hexameron league. Under this aesthetic rubric, the music assumes the condition of the environment it mirrors — inhuman, unfeeling, remorseless, devoid of sympathy — as though written more from the point of view of the landlord of the inferno than of its tenants. For this distinct accomplishment the composer should be applauded, equally so for bringing it off with a sense of entertainment, prankishness and wit. Moments in the cycle can elicit genuine laughter from enlightened audience members – no, not the kind of laughter arising from “foolish and unprofessional” display (Cage railed against these evils! ), but on the contrary, laughter that is occasioned by artifice. To play the devil’s advocate, let’s turn the argument on its head. Could we not pose the question, does this opus — the composer’s own written assertion that it is ‘decisamente lontano dalla tradizione romantica’ notwithstanding — project a Romantic profile just the same in spite of itself? Is it not an example of program music, a collection of character pieces, organized on a literary theme, a work with a narrative thread and virtuoso appeal? Does it not put to use one of the fundamental principles of Romantic composition, namely that of cyclical recurrence and development? Stands it not in familial company with Pictures at an Exhibition, for instance, which also explores the grotesque and monstrous (gnomes, catacombs, witches…)? At this point in the debate, I examine architectural features of the work for an answer. Consider the final piece and its ending. Terse, nervous, and lightly scored, it is the antithesis of what the Romantic composer would supply to cap a discourse this broad. A probable Romantic treatment would plumb the last Canto of the Circle Eight chapter and add a weighty tenth piece about the giants and the central pit of Malebolge, bringing things to a grand apotheosis. Baratello abstains. No glorified re-emergence to see the stars again for him (of course he isn’t dealing with that part of the Canticle, as Liszt did). Boglia X, instead of a profound epilogue, is rather a frantic telegram from Hell. How appropriate the ending is, tightly proportional and bound in process to the cycle’s very opening. Consider now the opening. No pompous introduction, instead, one line of music broken into three concise, chordal pronouncements, fortissimo. Other properties tie the incipit to the last bars of piece nine: the strange feeling that A is a tonal center common to both regions, and that a systemic progression is in motion. By the second bar of the mf that ensues from the opening chordal statement, the composer has articulated five of the available six intervallic tritone groupings within the chromatic scale, beginning with C + F# and stopping a B + F. (The exact exposition goes C + F#, E-flat + A, B-flat + E, B + F, and pitches D and G# are stated in relatively close proximity to each other within the first two phrases). The pair of omitted pitches in this sequence, C# + G, finds attainment only in the very last piece, in the last two bass eighth notes of the cycle, partnering with the C + F# that launched us on this journey, and firmly bringing closure with a resolute punctuation mark. I am more than persuaded that the composer is true to his artistic purpose, and though remnants of Romantic scaffolding may be detected in the underlying concept of the work or on its surface*, Baratello has staked out his aesthetic territory and stuck to his guns, successfully to ward off any serious gathering of 19th century demons. If it is necessary to point to a viable precedent for this Dante cycle, it won’t be found in forerunners from la belle époque, but immediately in the composer’s 1999 series of 13 pieces for solo flute, Voodoo Child, a work possessed of its own demonic power, based on songs by Jimi Hendrix. *We must concede that both Baratello and Liszt, in his Dante Sonata, begin with the “diabolus” – the tritone, or “devil’s interval.” And is it only incidental that such a strong similarity exists between the last page of Baratello’s work and the first page of the seventh piece (“The Market Place at Limoges”) in Mussorgski’s Pictures? The Italian-American Curt Cacioppo is composer of the concert length work Trilogia dantesca (2006) for piano, orchestra and chorus, and is Ruth Marshall Magill Professor of Music at Haverford College near Philadelphia, Pennsylvania, in the U.S.A., and recipient of a lifetime achievement award in music from the American Academy of Arts and Letters. Notes for my upcoming release of “The Realm of Possibility” and “After Duchamp” by Mark Hagerty, on the Meyermedia label. The character and argument of The Realm engage me. The work’s emotional narrative exteriorizes an autobiographically authentic psychological history that, though sometimes refracted through scientific metaphor, ultimately roams a varied inner human terrain to intersect with natural processes and phenomena remote and beyond. The opening Outburst invites multiple possibilities for interpretation. Maybe what we have here is a mosaic of dissociated elements cemented together onto a condensed surface area. Each little tile repels against the one(s) next to it, infusing the overall image with dynamic energy that radiates from the interstices. Or, perhaps this is a table of contents written like a ransom note with letters of different size, shape and color cut from magazines and pasted in. The text is a series of incipits from the pieces that will follow, a sort of thematic catalog. Then again, this could be a temper tantrum – a clock quietly ticking, then a rude, injurious kick followed by an explosion of vehement rage, notes flailing about until pinned to a static fermata, and so on as the brief scenario unfolds. However, the most curious feature here seems to me the repeat sign, the fact that the composer reiterates the initial sequence of events, making the point that it should be heard as a thematic unit in itself. This I feel is cinematic. Imagine a projectile multi-angle video camera launched at the moment of the Big Bang filming the first phases of cosmic formation. It captures the pulsation of distant frequencies, the propulsion and collision of enormous bodies of fiery matter, passage through asteroid showers, the cooling of planets. This footage then exists to be replayed, the episode stands as a chapter in the evolution of time, to be analyzed and understood. We can freeze-frame anywhere, and investigate and theorize about each event in however much depth and at however great a length we desire. The idea of stars twinkling, of asteroidal “sharp edge-eyed rocks” shining brightly, carries over into Patterns. Mark spoke of crystals; an artwork in his collection that resembles constellations strewn upon a flexible swath of universe adds to the inspiration. Eclogue, Mark says, is a nod to my own (much earlier) composition of the same title. Maybe there are similarities between the two, but in my view Mark’s is really akin to a Chopin nocturne, which genre by definition refers to the rotation of the earth. I particularly enjoy the stratification of triadic outlines vs. dissonant elements, and although it is quite pianistically idiomatic, I go for a harpsichord sound in certain stretches. Corona further extends the celestial motif. In the opening I feel that we’re looking up at the moon on one of those occasions when it appears in the clear blue daylight sky…looking up with child’s eyes. The music turns to introspection and yearning. Again the quiet repeated notes, here paraphrasing Schumann’s Mondnacht, one of the songs in Liederkreis, Op. 39, which Mark and I used to work on many years ago. That song, on a poem by Eichendorff, has these repeated note pulsations all throughout. Its astral, spiritual imagery speaks of the moon silently kissing the earth, the wheat gently wavering, the wings of the soul spreading into homeward flight. In Mark’s “version,” I sense not religious allegory (although the melody will indeed appear later as a chorale) but that an urgent brooding is being recalled, a longing to free oneself, as a young adult, from the social influences that had shaped you (or tried to) growing up. I love bringing out the harmonic changes of intense shadow and glow. What a gem, this Irrational Number. I am a huge fan of sustained/legato tones against staccato, and there are conspicuous examples of this here. The way the phrases unfold or truncate is humorous, even wry, the dynamic contrasts result almost in caricature, and asymmetrical meter playfully prevails. Meditation presents a four-part Bach chorale style statement of the sehnsüchtige Melodie from Corona. The progression of harmonic intensities reflects highly personal control of color and line, the inner parts masterfully constructed. Penumbra juxtaposes moods of innocence (the infant in his crib looking up at a mobile) with a recurrent spinning figure initially pastoral but later very ominous. (I hear echoes of Mussorgski’s Promenade motif throughout.) Facets is a kind of “romp through Rio” – Mark is often in Brazil, and has ongoing collaborations with musicians there. He says that some of the material here is descriptive of me, both personally and as a player. In Fields you might say that the repeated notes that we heard at the very beginning of The Realm, then in Corona and elsewhere, are slowed down in the extreme to become a powerful A-flat pedal point throughout this movement. Against its tolling, Mark builds pyramids of vertical sound, starting from a central point and expanding outwards in either direction – if you turn the score sideways you can visualize them –, the far greater percentage of which are off the beat. Again the interstices are highly charged. Combustion – what can I say? It takes the Chopin b-minor Scherzo to the next level of insanity. The ratcheting, fricative repetitions at a peak moment suddenly uncoil in a scorrevole passage in invertible counterpoint that is brilliant both in itself and in its rhetorical placement. Huge masses of vertical sonority articulate the landscape of Formations. These are the Cliffs of Moher in Ireland. Triads of e-flat minor and C Major, c minor and A Major, a minor and F# Major collide like architectonic plates. In complement to this, Mark introduces a balmy theme in two-note slurs (which in fact will reappear in the Duchamp set in altered form), and with it, the meditative chorale returns, this time as a prayer for the planet. On the jocular side, Werk ohne Opus is a hilarious, domestic “battle of the bands” number. Teens are trying to figure out their vamp in one room of the house, retuning their guitars, adjusting the amp, and so on, while their classical keyboardist parent is attempting to play the Goldberg Variations in another. Now I know Shiva is a Hindu deity, but what comes to my mind when I play these pieces is entirely automotive – she “revs up” her 1950 Chevy 1500 pickup, clicking and clacking in #5, and drives it to Dover Speedway to watch (and hear) the NASCAR race in #6. The “fleeting fragments” (#7) remind me of an interlude in the last movement of Beethoven’s 9th Symphony, which always reminded me of the gods on Mt. Olympus looking down on human conflict with laughter. And in the encore, a paraphrase of Couperin’s Le barricades misterieuse, I envision a traffic cop in Paris on Friday, directing the flow but mentally occupied with commencing his well-deserved weekend in the country. As for bird/anger, I go back to my score and see what I wrote in after talking with Mark about how I might interpret it: measure 3, “insult;” measure 13, “inflamed;” measure 21, “wrath;” measure 31, “poison.” Remember the Monty Python bit when Beethoven shoots the mynah? Writing to his parents July 25, 1825, Franz Schubert says of his piano playing: “…people assured me that under my fingers the keys were transformed into singing voices…” and further “…I cannot abide that cursed hacking of the instrument to which even first-class pianists are addicted: it pleases neither the ear nor the heart.” This is the secret to making Schubert sound on the piano. Notes from my Nov. 30 performance of Winterreise with baritone Alexander Dobson. The avant-garde aspects of Winterreise, which disenchanted its first listeners, are precisely those that made Schubert esteem the cycle above all his other songs, and that give it its ever-increasing durability and relevance. Standing at the existential precipice, Schubert brought forth from the depths of his being a music of greatly heightened intensities in relation to dissonance, melodic profile, dramatic and dynamic contrast, and perhaps above all, time. On the one hand, we have numbers in which tempo and duration are tightly compressed (“Der stürmische Morgen,” for instance, lasts little more than 40 seconds), and information density weighs heavily, while on the other, the composer, through emphatically slow metronome markings and unremitting chord/pattern repetition, imposes near stasis on us (“Rast,” for example, presses the point). Phrase asymmetries occur frequently (the measure count is truncated or elongated), and polyrhythmic stratification occurs between the parts (“Rückblick” has the piano in 6/8 and the voice in 3/4 at spots, with even more complex layering elsewhere). An erratic quality takes hold in “Die Wetterfahne” and “Frühlingstraum.” Haunted space and eerie silence create anticipation in “Wasserflut” and “Irrlicht.” Melodies often outline dissonant intervals – the opening of “Gute Nacht” right away descends the interval of a minor ninth, then jumps a 7th and a 4th. Lyricism is still possible – the first quatrain of “Die Krähe” rivals Schubert’s popular “Serenade” in its suppleness of line. And elegance still obtains, even in “Der greise Kopf,” with the vocal ornaments and grace note turns in the piano. For me, the degrees of contrast within “Frühlingstraum” propose dissonance in all parameters. Play the quaint Siciliano phrase of the first bars, and then cut to the last bar of the 2nd ending – the lugubrious arpeggiated minor chord. I cannot cite another such example in which the beginning and ending of a two-page piece contradict one another so obdurately, unless I venture into the repertoire of the 2nd Viennese School, which would not emerge on the scene for almost another 100 years. Celia Sgroi, whose commendable translations we used for our program, renders the last line of the cycle – “Willst zu meinen Liedern deine Leier dreh’n?” – as, “Will you play your organ to my songs?” At the end of my second paragraph, I condense this to “Will you play my songs?” in order to make my point. I’d like to return to the line in its entirety, and offer further exegesis to reinforce and elaborate that point. Let’s look at the verbs. The word willst is used, the 2nd person singular informal of the verb willen in the present interrogative. Willen means “to want,” as contrasted with werden, which coupled with other infinitives creates the future tense in German, as happens in English with “will,” — werdest…dreh’n would strictly equate to “will you…play” — or wünschen, “to wish” – wünschest…dreh’n, meaning “do you wish…to play.” Drehen does not really mean “to play” (the direct equivalent is spielen). In the modern sense it denotes circular movement – turning,* rotation, rolling (as in film — “roll the cameras”), or apropos our text, cranking ’round and ’round the turnkey lever on a mechanical organ/lyre or “hurdy-gurdy.” The etymological roots of the word serve only to deepen its significance here, as a Proto-Germanic/Indo-European cognate reaching back to the Greek thrēnos (threnody), or dirge. A defining characteristic of the dirge is its grounding on a sustained tone, or pedal point. In fact, all forms from the stem – dhrēn, dran, dræn, Drohne, and many more from various archaic languages and dialects — leading to our current English word drone, refer to the monotonous buzzing of male bees. Perhaps the author intends our protagonist to be understood as a drone himself, his queen finished with him and leaving him spent of life, the Leiermann droning an accompaniment to his songs. But before moving on with interpretation, let’s wrap up our word analysis. The nouns – we have Liedern (songs) and Leier (this mechanical lyre that the organ-grinder plays). And the possessives – meinen and deine, mine and yours. Finally the preposition zu – to. A more scholastic translation of our author’s lyric might better be, “Do you want to drone your [mechanical] lyre to my songs?” The question takes on a more plaintive resonance this way, asking for partnership and accompaniment. (To be sure, this is precisely what Müller asks of the composer – he himself regarded these verses as lyrics rather than freestanding poetry, and sought musical setting to complete them.) In the complementarity of the words Liedern and Leier one sees a possible metaphor for cooperation and sympathy. One might even read in a subtle attempt to allure. But Schubert assumes the role of translator in this process as well, and it is he who stokes the query from entreaty to plea by means of dynamics, accent, dissonant inflection and rhetorical gesture. In the same way that he imposes an alternative order upon the author’s original sequence of texts, Schubert makes the ultimate determination as to their tone and meaning. Either way, the Drehleier symbolizes circularity both in its manner of sound production and the repetitiousness of its tune. A broken ring in Song #7 represented discontinuity of union, the circling flight of a crow overhead drew a lariat of death in Song #15. By the final song, circularity defines in terms of enclosure and endless confinement, a perpetual frozen state of psychological affliction. For some the organ-grinder is a grim reaper figure or the devil himself. His motion ensnares the tired soul, lassos it, loops a noose around it, to rope it down into the circles of Hell. Such is the circularity that swallows our protagonist, in stark negation of the circular return of spring and the thaw and love, the goal of his longing all throughout the cycle. *Fans of Hindemith will recall the Schwanendreher, based on a medieval German folk song that speaks of the person who turns the swan on a spit over the roasting fire. July 26 is the official release date for the Navona Records organ music CD “HEAVY PEDAL.” The disc features Di Cibo Celeste by Curt Cacioppo, performed by organist Robert Gallagher. The work, commissioned by the Settimana Organistica Internazionle of Piacenza, Italy, is a ciaconna-fantasia on elements from Mozart’s “Don Giovanni.” Cacioppo’s work stands alongside those of four fellow composers, the compilation representing international talent from the U.S., England, Australia, Germany and the Czech Republic. The CD also includes an enhanced content component which allows you to follow the score while listening, read artist biographies and commentaries, view session photos, and more. This is Cacioppo’s 11th composer release. This is serious contemporary chamber music at its best. Cacioppo is a contemporary American composer who loves Italy. He writes in an idiom that sounds “modern” although I am not able to analyze what he is doing technically. There is discord and sections with unusual rhythmic intensity. But the music, evoking traditional Italian scenes, is expressive, even romantic in spots. At times busy, at times lyrical, it grows on you. At one point, in the section evoking the Piazza San Marco, a festive popular dance struggles to emerge before fading back into the denser texture. The three separate pieces all have this same quality. The first, “Impressione Venexiane,” is played by a string quartet, the second, “Sulla Via dei Sette Ponti” is played by Matthew Bengtson, piano; the third, “Colomba scarlatta della Libia” features a variety of instruments. Very fine music.